After we were able to move onto the Monk, life quieted down out here. With little adventure, there wasn’t a lot to write about. Instead, we’ve just been enjoying boat life and taking in the beauty of our surroundings. We did make a trip back to Ontario in the fall for a wedding. While we were there, we were able to do the logical boat thing – go and check out a friend’s new boat and help him put it up for the winter. Once back home, we decided that we wanted to have a very low-key holiday season. We spent too much time marathon-watching TV, but made sure that we took Lenny on a few adventures. 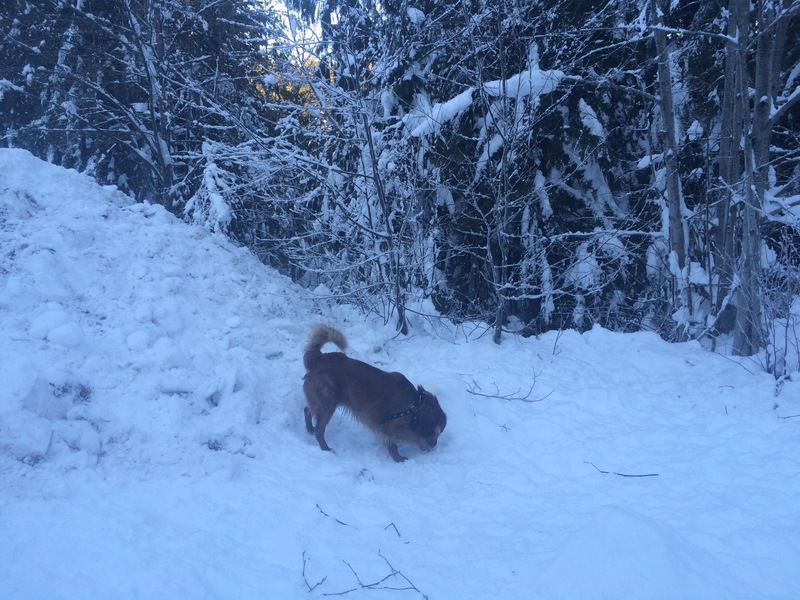 As much as we both love the mild weather of the west coast, we agree that every dog should have the chance to play in the snow – so up the mountain we went in search of some winter for Lenny. For our last excursion of the break, we decided to go to Point Roberts. For those of you who have never heard of it, it is a small (five square mile) peninsula which belongs to the US. Afterwards, we had a quick dinner and headed home. As for our next adventure? Stay tuned and expect a big reveal in my next post!